Dave Grandt operating the main yard on Jim Vail’s layout. Note all the toggle switches, and other controls on the fascia of the layout. The black object at the lower right under the fascia is a TV monitor showing a hidden staging yard. While talking with Jim Vail about his column for this issue, I mentioned that I would like to visit his layout during an operating (ops) session. Jim holds ops sessions every other month, alternating with Dave Adams’ magnificent On3 Durlin Branch of the Denver & Rio Grande Western. Jim phoned a few days later to invite me to his forthcoming Saturday ops session. I was concerned about the traffic over Highway 17. That Saturday was the first beautiful day we had had after many weeks of rain. So, I thought everyone in Silicon Valley would be on the steep and winding Highway 17 on the way to the beach. I was wrong, and had no trouble driving to Jim’s home. When I parked and walked up to Jim’s front door, I found a note that said, “Come in, we’re playing trains downstairs.” How true! Jim’s layout is not in a basement, but in a room below the main floor of his house. You enter his layout down a staircase lined with railroad photos, timetables, paintings and artifacts – and thread your way through and around lanterns, oil cans, pieces of rail, and even a big brass locomotive bell. As I descended the stairs I heard the murmur of voices. At the bottom of the stairs, I found a group of local model railroaders including Gary Schrader, known for his O gauge locomotive rebuilding. He was telling the group about some neat LEDs he had found. 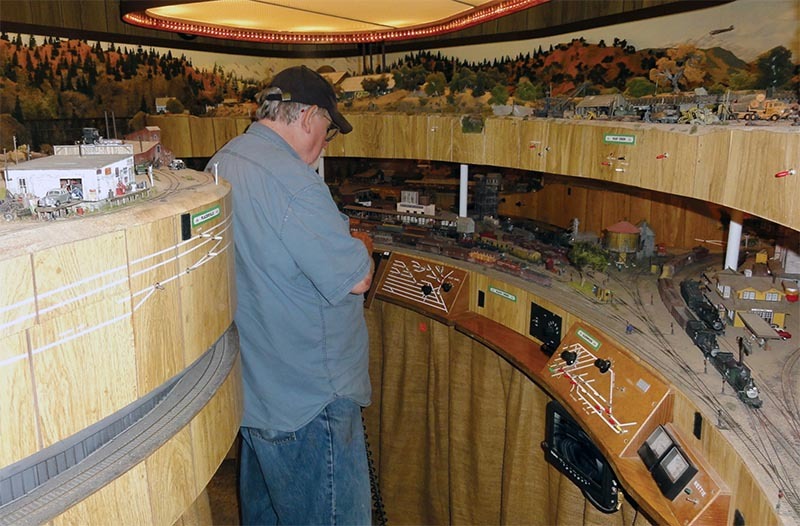 Mike Schwab, builder of a superb Sn3 Colorado layout, was describing a new “Blacken-It” he had recently tried, Mike Musal, an On3 logging modeler was there, as was Bob Poli who has written about his 1:20.3 scale West Side Lumber Company models many times for GAZETTE readers. Jim had thoughtfully provided donuts and coffee. It seems that they all were waiting for Dave Adams to arrive, because, as Chief Dispatcher, he had all the train orders. Soon Dave Adams came down the stairs with Dave Grandt, son of legendary On3 pioneer, Cliff Grandt, and with Sn3 West Side modeler, Steve Anderson. 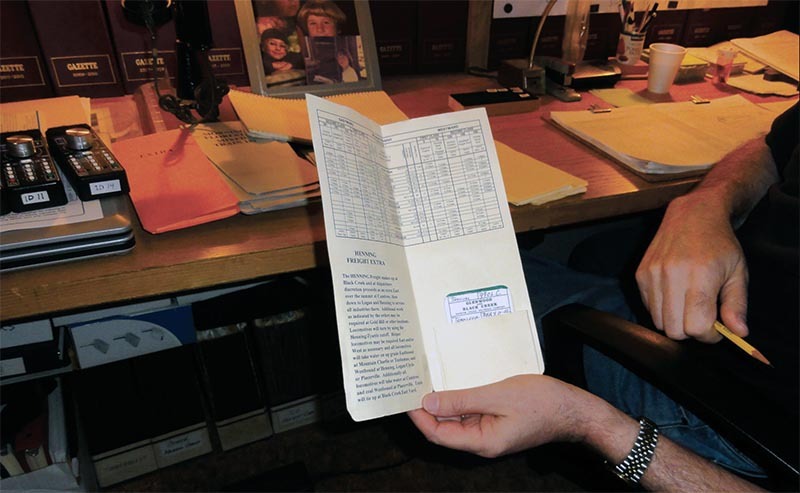 Dave Adams soon sat down at Jim’s dispatcher’s desk, and began filling in forms. Then he asked the operators which trains they wanted to run, and handed each a folder of instructions (described by Jim on page 83 of his article this issue) along with a CVP Easy DCC hand-controller. I opted to watch, and take photos. Soon everyone was at his post. Dave Grandt acted as yardmaster, and began making up trains. Jim then announced: “The clock is running,” and turned on the fast clocks. Before I knew it, reports began coming to Dave Adams – such as “6:45 out of Rico has left,” or “7:35 train has arrived at Cumbres.” Some of these messages came over an intercom, some were just shouted out (quietly). Dave dutifully entered the arrival and departure of each train on a big Dispatcher’s Report. The inside of one of Jim’s ops folders. Note the pile of other ops folders on the desk, and the CVP Easy DCC controllers. I was impressed with how slowly and reliably the trains ran. They were realistic and smooth. I was also impressed with how serious the operators took their jobs, and how much they seemed to enjoy the ops session. Ops are an important part of our hobby. After all, when you have spent 20 to 30 years building a layout, what else are you going to do with it? 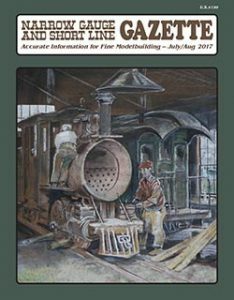 Read Jim’s article on page 82 to see how he planned his layout for ops. His layout is really magnificent. I am told that Dave Adams flies around the United States to attend ops sessions. He really loves ops, and his magnificent Durlin Branch is the result of this interest. I am not sure ops are for me. Too much like a puzzle! And, I don’t like puzzles. Also, my layout would have to work! The couplers would have to stop uncoupling, the locomotives would have to run reliably, the turnouts could not short, the track would have to be perfect, and I would need a maintenance program like Jim’s. But, I can see ops sessions as a wonderful way to share our hobby with friends. Dave Adams has seen my layout, and once suggested that my 30-foot-long tunnel would make a great staging yard. I could park three or four trains on the mainline inside the tunnel, and bring them out one at a time. First, a train of log cars for the sawmill (where they would be unloaded). Then, the empty log train could be spotted back in the tunnel behind the other trains. Next, I could run a passenger train, (or a railcar) around the layout, move all the trains up, and run the next train in line, perhaps, a peddler freight. After setting out (and picking up) cars around the layout, the peddler freight could go back to the end of the line in the tunnel. Gee, that sounds “doable” – maybe I’ll try it – after I get everything working.